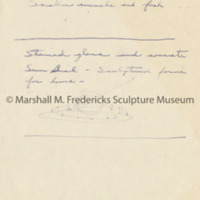 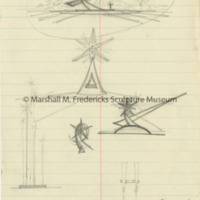 Unidentified sketches, possibly for "Persephone (Bacchante)" and Sun Dial Airport Beacon. 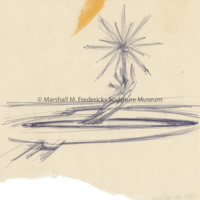 Unidentified sketch of hand holding orb, possibly unrealized. 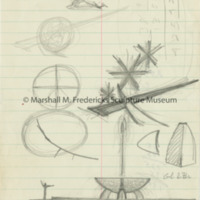 Sketch for "Sundial Airport Beacon"
Sketches for "Sundial Airport Beacon"
Model for Sundial Airport Beacon project that was never realized. 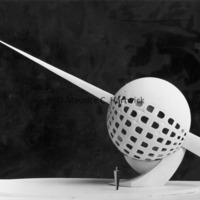 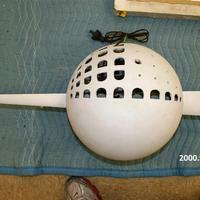 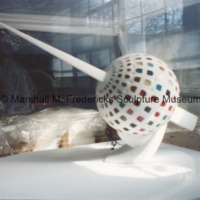 A sphere with several rows of cut-out holes that has an elongated pyramid shape piercing through the sphere. 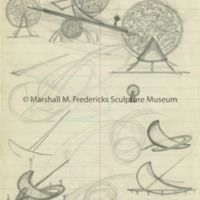 Presentation drawing for "Sun Dial Airport Beacon"
View of scale model for "Sun Dial Airport Beacon"
Scale model for monumental re-enforced concrete and stained glass airplane beacon. 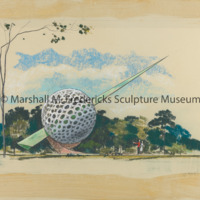 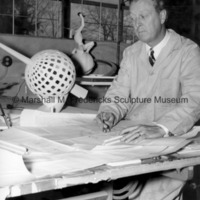 Scale model for "Sun Dial Airport Beacon"
Marshall Fredericks drawing plans for "Sun Dial Airport Beacon"
Marshall Fredericks draws up engineered plans for monumental re-enforced concrete and stained glass airplane beacon from the small-scale model in foreground.